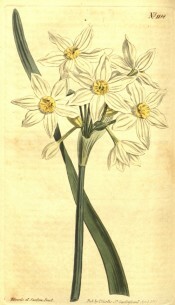 See Narcissus tazetta L. for a description of the species. Italicus is similar to Narcissus tazetta but with pointed, creamy-white perianths and yellow cups. Early flowering. [RHSD, Baker Am.]. First botanically described as Narcissus italicus by Ker Gawler in 1809 [BM t.1188/1809]. Recognised as a subspecies of Narcissus tazetta L. by Baker in 1888 [Baker Am.]. ‘Probably a native of Italy. In the parcels of Bulbs of this genus, which are annually imported from thence by the Seedsmen, we have never met with any others than those of italicus, papyraceus (No. 947) and the two varieties of orientalis already figured in Nos. 1011 and 1026. Tazetta was never among them. All four being very closely allied, and having been usually considered varieties of each other’. [BM t.1188/1809]. ‘A tender species, hardly worth cultivating here; for its flowers have a sickly hue, as if they had been deprived of light, changing, as Parkinson remarks, to “a more sullen yellow colour”, and they come out later than most of the others, which is no recommendation in forcing. I believe it grows wild in the Island of Cyprus.’ [THS vol.1 p.358/1805-1812]. Listed only in the 1857 catalogue [B.343/1857]. The Royal Horticultural Society’s Botanical names in the genus Narcissus considers Narcissus italicus Ker-Gawl. to be a valid species. I have included it here as a subspecies of Narcissus tazetta L., following J. G. Baker, for ease of comparison with other Narcissi listed in the Hortus. The latter name is accepted as valid by The Plant List. Probably Mediterranean, but according to Baker extending from the Canary Islands to China. [Baker Am.]. Hermione chlorotica Jord. & Fourr. Hermione italica (Ker Gawl.) Haw. Hermione pratensis Jord. & Fourr. Narcissus byzantinus Turra ex Marz.-Penc. Narcissus floribundus Schult. & Schult.f. Narcissus tenuiflorus Schult. & Schult.f. Narcissus tinei Tod. ex Parl.